Not all electrical systems can be characterized properly in the time domain. Circuits like filters, amplifiers, oscillators, mixers, modulators and detectors can be characterized best by their frequency behavior. That frequency behavior is best obtained by observing the electrical signals in the frequency domain. To display the frequency domain, an instrument is needed that can distinguish different frequencies from each other and measure the signal size at the different frequencies. An instrument that can display the frequency domain is the spectrum analyzer. In the time domain all frequency components of a signal are seen summed together. In the frequency domain, complex signals (signals composed of more than one frequency) are separated into their frequency components, where the amplitude of each component is displayed. 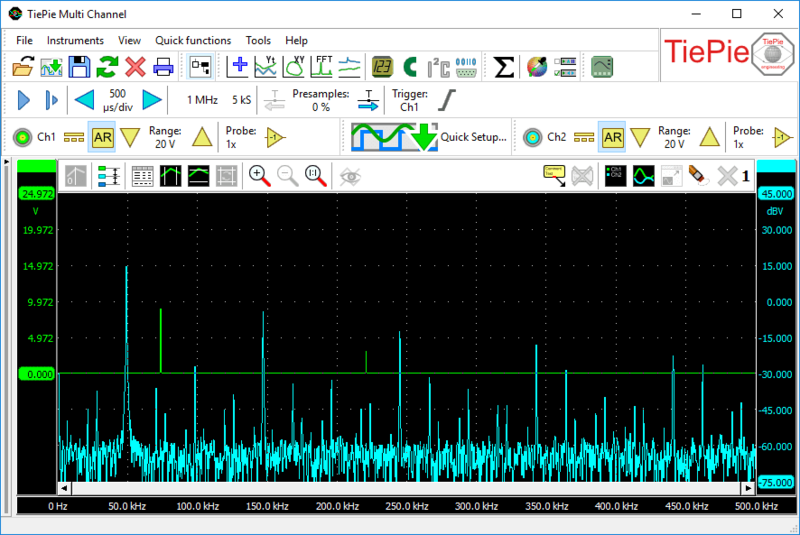 The spectrum analyzer function in the Multi Channel oscilloscope software uses a Fast Fourier Transform to convert the time domain to the frequency domain. Various different windowing functions are available to minimize the effect of spectral leakage. The spectrum analyzer can have one or more graphs, each displaying one or more signals, where each graph can display different parts of a signal. Colors of all items in a graph can be set to any required value. Graph dimensions can be adjusted to any required size, graphs can be located in one single window or in separate windows, which can be located anywhere on the desktop. Axes can be set to linear or logarithmic. Cursors are available to make on screen measurements, including determining the Total Harmonic Distortion in a signal. Signals can be given descriptive names and a legend is available to simplify identifying the displayed signals. Text labels can be placed to mark interesting parts of the signal(s). To reveal all details of the measured signals, unlimited zooming is available in both vertical and horizontal direction. All zoom actions can be undone with an undo zoom function. Controlling the spectrum analyzer is done through customizable toolbars, through popup menus and by hotkeys. A quick function toolbar is available for often used functions.